ex-Betty, ex-Epiros, ex-Popi, ex-Refalonia, ex-Sayonara, ex-Goize Ko-Izarra, ex-Romola, ex-Sans Peur, ex-Catarina, built 1880, 563 gross tons, passenger steamer. A large group of refugees was permitted to leave Vienna, organized by Berthold Storfer, a Jewish businessman working under Adolf Eichmann. 1,771 came down the Danube on the river steamers Schï¿½nbrunn and Helios, and 1,880 on Uranus, and Melk, arriving in Romania. They passed the people marooned at Kladovo and the Pentcho halted between Romania and Bulgaria. The Uranus passengers, numbering about 1,000, boarded the Pacific. 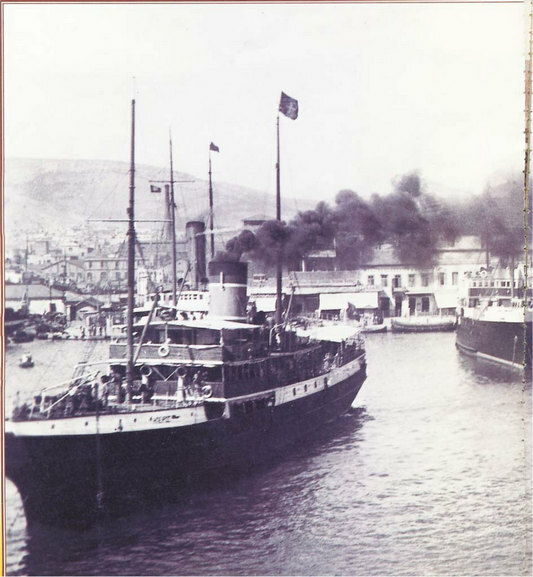 Pacific arrived at Haifa followed by the Milos. Their passengers were transferred to the French liner Patria (1) for removal to the island of Mauritius. The Haganah smuggled a bomb on board to prevent the liner from sailing, but too big, it blew a hole in the side of the ship, Nov 25th , which capsized. 254 persons died. The survivors were permitted to remain in Palestine by order of Winston Churchill. (1) Patria, 11885 tons, built 1913.